This beautiful book features over 100 pictures in full colour, architectural details of leading Toronto churches, complete stop lists for 36 organs and many historical and technical details. Purchase this book for $ 45.00 plus $ 10.00 shipping in Canada or $ 15.00 shipping outside of Canada. "I rejoice (in this book), as will anyone who loves organs and knows what an important part they have played, and continue to play, in the life of the city." 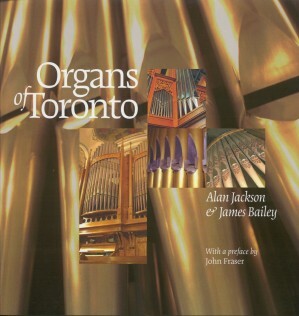 This companion CD showcases 13 magnificent instruments featured in the Organs of Toronto book performed by some of Toronto’s finest organists. You may purchase this CD separately or in combination with the book. The CD on its own is $ 20.00 plus $ 5.50 shipping and handling in Canada or $ 7.50 outside of Canada. You may purchase both the Book and the CD together for $ 55.00 plus $ 10.00 shipping and handling in Canada or $ 15.00 outside of Canada.